Microgrids provide less than 0.2 percent of U.S. electricity, but their capacity is expected to more than double in the next three years. Of the 160 microgrids in the United States, most are concentrated in seven states: Alaska, California, Georgia, Maryland, New York, Oklahoma, and Texas. Interest in microgrids is growing because of their ability to incorporate renewable energy sources and sustain electricity service during natural disasters. To increase deployment, a clear legal framework is needed to define a microgrid and set forth the rights and obligations of the microgrid owner with respect to customers and the larger utility grid operator. Microgrids are relatively small, controllable power systems composed of one or more generation units connected to nearby users that can be operated with, or independently from, the local bulk (i.e. high-voltage) transmission system, sometimes referred to as the “macrogrid.” Since the energy (power and heat) are created close to where they are used, microgrids are a form of distributed generation. Historically, microgrids generated power using fossil fuel-fired combined heat and power (CHP) and reciprocating engine generators. Today, however, projects are increasingly leveraging more sustainable resources like solar power and energy storage. Microgrids can run on renewables, natural gas-fueled combustion turbines, or emerging sources such as fuel cells or even small modular nuclear reactors, when they become commercially available. They can power critical facilities after a weather- or security-related outage affects the broader grid. Microgrids can also be the main electricity source for a hospital, university, or neighborhood. While single-user and campus microgrids, such as those that serve an industrial site or military base, have existed for decades, many cities are now interested in systems that can better integrate generation resources and load, serve multiple users, and/or meet environmental or emergency response objectives. Number of customers: Microgrids can serve a single building, multiple customers in a limited geographic area, or customers across an entire community. Microgrids commonly range in size from 100 kilowatts (kW) to multiple megawatts (MW). Load types and functions: A general purpose microgrid provides or supplements the services customers might otherwise receive from the macrogrid. A “community microgrid” serves a public purpose, such as powering police and fire stations, cell towers, and pumping city water and wastewater during emergencies. Community microgrids can also serve general purpose needs by providing power to displace or supplement service from the macrogrid on a day-to-day basis. Connection type: An off-grid system does not connect to the macrogrid and thus must be a sufficient power source for its customer. A microgrid connected to a macrogrid has greater flexibility since the macrogrid functions as an additional resource. Microgrids provide a tiny fraction of U.S. electricity. In 2016, the United States had about 1.6 gigawatts (GW) of installed microgrid capacity out of 1,066 GW total capacity. That is expected to increase to 4.3 GW by 2020. Most microgrid projects are in Alaska, California, Georgia, Maryland, New York, Oklahoma, and Texas. Microgrids are attractive to many large U.S. companies committed to working on their own and in partnership with governments to transition to a sustainable low-carbon economy. For example, NRG Energy, one of the country’s largest independent power producers, has turned its Princeton, New Jersey, headquarters into a fully-islandable microgrid demonstration project laboratory from which the company can test ideas for real-world applications. NRG is also collaborating with grid operator PJM to explore ways that microgrids can help enhance macrogrid operations. 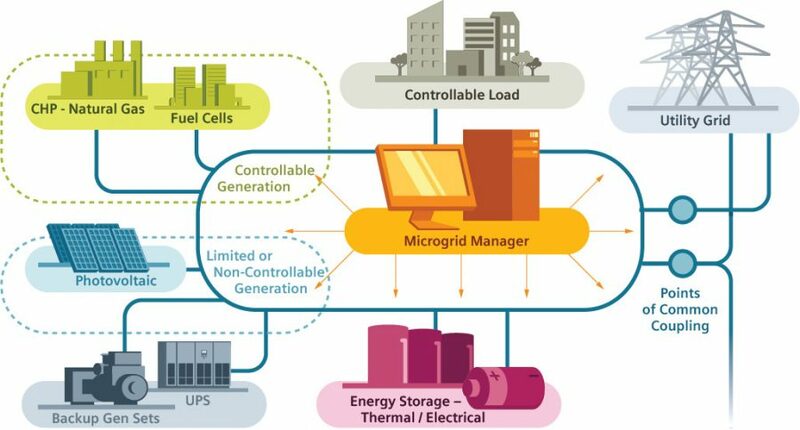 Elements of a microgrid could include: controllable generation like natural gas-fueled combined heat and power (CHP) and fuel cells; limited or non-controllable generation like a photovoltaic solar array or wind turbine (not shown); backup generators; uninterruptible power supply (UPS); and energy storage capability. The microgrid manager (at the center) balances generation and load. The microgrid interacts with the local distribution network or the macrogrid through the points of common coupling. Microgrids have several benefits to the environment, to utility operators, and to customers. Microgrids offer the opportunity to deploy more zero-emission electricity sources, thereby reducing greenhouse gas emissions. The microgrid manager (e.g. local energy management system) can balance generation from non-controllable renewable power sources, such as solar, with distributed, controllable generation, such as natural gas-fueled combustion turbines. They can also use energy storage and the batteries in electric vehicles to balance production and usage within the microgrid. Microgrids can make use of on-site energy that would otherwise be lost through transmission lines and heat that would otherwise be lost up the smokestack. When power has to travel long distances (e.g. from a centralized power station), line losses occur, requiring additional generation to ensure that far away demand is met. Since microgrid electricity is generated next to where it will be used (also known as distributed generation), line losses are minimized and less power is required to meet the same level of demand.Also, when electricity is generated from certain centralized power sources (e.g., fossil fuels and nuclear power) a great deal of heat energy is created and typically released – unused – into the atmosphere. When power is generated close to the end users, it becomes economically feasible to use this heat energy productively, such as heating water or space in nearby homes and businesses, reducing greenhouse gas emissions. Microgrids can improve local management of power supply and demand, which can help defer costly investments by utilities in new power generation. When sited strategically within the electricity system, microgrids help reduce or manage electricity demand and alleviate grid congestion, thereby lowering electricity prices and reducing peak power requirements. In this manner, microgrids may support system reliability, improve system efficiency, and help delay or avoid investment in new electric capacity (e.g. “peaker” plants, substations, transmission lines, energy storage or other infrastructure). When connected to the local distribution network or transmission system, microgrids can also transact from a single node to export excess electricity or import imbalances from the surrounding system. Microgrids can enhance grid resilience to more extreme weather or cyber attacks. Microgrids can continuously power individual buildings, neighborhoods, or entire cities, even if the surrounding macrogrid suffers an outage. This concept of a microgrid functioning independently from the surrounding system is known as islanding. Microgrids can also help the macrogrid recover from a system outage, either indirectly, by sustaining services needed by restoration crews, or directly, by helping to re-energize the macrogrid. Microgrids can help deploy more zero-emissions energy sources, make use of waste heat, reduce energy lost through transmission lines, help manage power supply and demand, and improve grid resilience to extreme weather. Financial and legal hurdles stand in the way of accelerating microgrid deployment. Microgrids tend to integrate multiple energy technologies and unique circumstances into a single project, making them complicated and challenging for investors. Each project can comprise different electric generation types and sizes, serve a unique load, be situated in a unique geography and market, and be subject to unique weather variability and regulations. In addition, while tax credits and preferential tax treatment exist for some of these technologies, they differ by technology, region, and ability of a developer to access. For example, solar and fuel cell technologies are eligible for a federal investment tax credit, but a municipality that does not have a federal tax obligation might not be able to use that credit. With so many variables, each microgrid project may require its own customized financial solution. Virtually all states lack even a legal definition of a microgrid, and regulatory and legal challenges can differ between and within states. Microgrids face three types of legal hurdles: (1) laws that prohibit or limit specific activities; (2) laws that increase the cost of doing business; and (3) uncertainty, including the risk that new law will be implemented to regulate microgrids and impose restrictions or costs not anticipated at the time of development or construction. Laws also can grant rights and clearly delineate obligations, facilitating development and financing, and making the project more attractive to potential customers. A number of potential solutions can encourage more microgrid deployment. Public-private partnerships can help overcome financial hurdles. Mixed ownership microgrid projects, which can include money from public institutions, utilities, and private entities, have increased from nearly zero in 2013 to a projected 38 percent of the market in 2016. Examples include microgrid partnerships at Peña Station Next in Denver, Colorado, and two government facility microgrids in Montgomery County, Maryland. States can facilitate microgrid development. California, Connecticut, Massachusetts, New Jersey, and New York have created clean energy banks, grants, or other funding opportunities for microgrids. For example, New York has established a $40 million grant program to create community microgrid projects. New Jersey created a $200 million resilience bank for the development of distributed energy resources. A clearer legal framework is needed to define a microgrid, and set forth the rights and obligations of the microgrid owner. Issues to resolve include the rights and obligations of microgrid owners to their customers and the interconnected utility, cost allocation, and access to wholesale power markets to sell excess electricity or other services. Linear programming models can help focus proposed microgrid projects on cost savings, emissions reductions, or independence from the macrogrid. These models can also be used to forecast or estimate cash flows and financing needs and determine strategies for managing power supply and demand, which could be useful during a project’s development and operational phase.